Ventec International is adding to its extensive thermally conductive laminate and pre-preg range with the launch of the VT-5A2, a next generation best-in-class, high Tg thin-core and pre-preg material. With a thermal conductivity 8 times that of FR4, VT-5A2 delivers class-leading thermal performance and high flow-ability for perfect encapsulation; this enables better board design for applications requiring critical thermal management in harsh environments. Customers can choose between thin core and pre-preg variants. VT-5A2 features a thermal conductivity of 2.2 W/m.K, a high Tg of 190°C, best in class thermal performance (T260 >60 Minutes, T288 >30 Minutes and T300 >15 Minutes) and M.O.T. up to 150°C. VT-5A2 is lead-free assembly compatible, fulfils RoHS and WEEE requirements and complies with UL94 V0. and/or by downloading the Ventec APP. 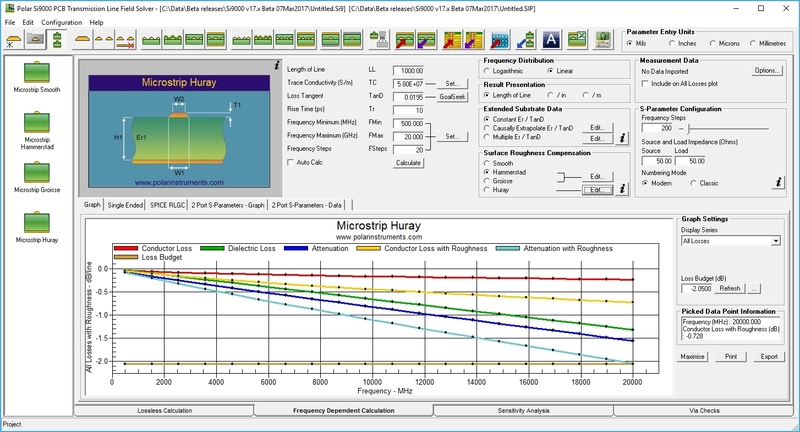 Si9000e now supports smooth, Hammerstad (for up to 4GHz), Groisse (for up to 10GHz) and Huray models – valid up to 40-50GHz. Do call your local office with any questions regarding this latest upgrade.